I love having dinner parties and the joy of the evening starts with sorting out the menu. Last Saturday night we had friends over for dinner and Dave and I sat down and discussed what we were going to make. We always sort out the main course first and then work out the starters and dessert after that. For this dinner party we decided on fish pie for a main course. Our starter was a venison carpaccio served on a bed of rocket with a vinaigrette dressing and shaved Parmesan. The fish pie contained hake, haddock, salmon, smoked angel fish and lobster in a fish stock and leek béchamel topped with mashed potato. Dessert was a plum tart tatin and ice cream. I never make canapés to go with our pre dinner drinks but as this months’ Daring Bakers’ challenge seemed to suit the occasion I went ahead and made these gluten free cheese breads. I was really sceptical at first about how tapioca flour would taste but I can tell you that they were divine and I am going to make these again. They are so easy to make and you really need to set aside only a small amount of time to get these made. I popped them into the oven just before the guests arrived which means you can make these in advance and have them hot and ready to serve with your drinks. I used the recipe for the cheese bread as provided to us in the challenge but I am going to try make them with other gluten free flours as I have quite a stock of these. I will also experiment with the addition of spices now that I know how they taste ‘as is’. Blog-checking lines: This month’s Daring Bakers’ Challenge took us on a trip to beautiful Brazil! Renata of “Testado, Provado & Aprovado!” taught us how to make Pao De Queijo, tasty cheese buns that make the perfect snack or treat, and that will make your taste buds samba! Tandy, I want to come to your dinner party! It sounds like you have planning down. 😀 I love to use tapioca starch over corn starch. I prefer the flavor and it is a wonderful thickener. I also use the tapioca starch as a thickener and you are most welcome for dinner any time! I didn’t do DB this month because I’ve made cheese bread previously (and loved it so much!). Your look lovely and puffy! Hi Tandy, how lucky to be a guest at one of your dinner parties, these sound divine! Wow, your dinner menu sounds fabulous! 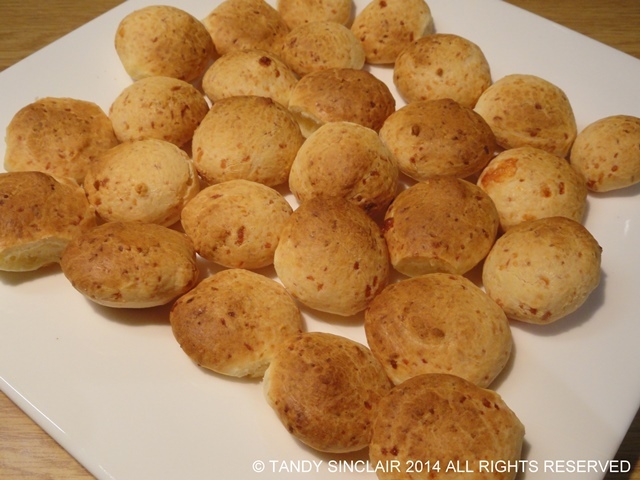 I’m proud to have had my pão de queijo as a starter for your guests! They look delicious! Thanks for joining in! Your dinner sounds so scrumptious, Tandy. The gluten-free cheese breads look very yummy. Do you have to put butter on them? Sounds delicious and very on trend vis a vis the World Cup. They were a perfect use of the tapioca I already had! What a lovely dinner menu Tandy.